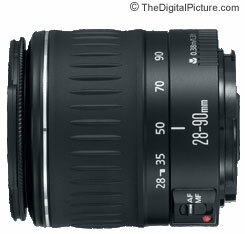 The Canon EF 28-90mm f/4-5.6 II Lens is basically the same lens as the Canon EF 28-90mm II USM Lens. The exception is that it utilizes MM (Micro Motor) in lieu of Micro-USM (Ultrasonic Motor) for autofocus. The realized difference between these two lenses is that the Micro-USM version will focus a little faster and a little more quietly. And the non-USM Canon EF 28-90mm f/4-5.6 II Lens costs less. Otherwise, read the Canon EF 28-90mm II USM Lens Review to see what else you get (or don't get) with the Canon EF 28-90mm f/4-5.6 II Lens.